Year 1 is taught by Mrs Handley on Mondays, Tuesdays, Wednesdays and by Mrs Philgence on Thursday and Friday. Supported by Miss Jackie. 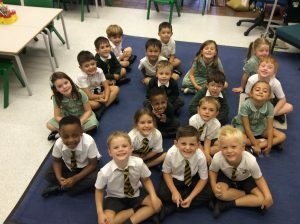 The class is made up of children aged five and six. The role of the teachers are to carefully plan engaging lessons that will enable children to become confident with the key concepts covered in the Year 1 curriculum, and to provide appropriate feedback to both children and parents to help them understand what they are doing well, and which areas they need to work on further. We also take the responsibility of nurturing the children seriously and to support them with this we make sure that we get to know all of the children as individuals, taking an interest in their hobbies, listening to their worries and concerns and celebrating their achievements. Miss Jackie works with specific groups both in and out of class to provide additional support for children of all abilities. At least once every week Miss Jackie reads one-to-one with each child. We are also lucky to have other volunteers who come to listen to children reading. The teacher and TA work closely together to ensure that all children receive any additional support they may need. If you have any quick queries, please feel free to catch me at the start or end of the school day. However, if there is anything you wish to discuss at greater length, please do let me know and we can arrange a suitable time to meet. 8.40 – 8.45am: Doors are opened and children settle down to Early Morning Work, which is typically handwriting or fine motor skills. During the day we also fit in some time for show and tell which is run on a rota so that each child gets a turn once a week. We feel that this is a very important part of the day as it helps them to become confident at speaking in front of others and to develop active listening skills. When collecting and dropping your child as school, punctuality is really important. Being late can result in causing distress to your child and interrupts their learning. Should there be repeated and/ or unexplained late collections you will be asked to meet with the Headteacher so that any issues can be resolved.